Mehrauli is a neighbourhood in the South West district of Delhi in India. It represents a constituency in the legislative assembly of Delhi. The area is located close to Gurgaon and next to Vasant Kunj. Naresh Yadav of Aam Aadmi Party is the current MLA from Mehrauli. Mehrauli is one of the seven ancient cities that make up the present state of Delhi. Mehrauli is derived from a Sanskrit word Mihira-awali. It signifies the town- ship where the well known astronomer Varaha-Mihira of Vikramaditya’s court lived along with his helpers, mathematicians and technicians. In 12th-century Jain scriptures, the location is also mentioned as Yogninipura, now noticeable by the presence of the "Yogmaya Temple", near the Qutub Minar complex, believed to have been built by the Pandavas. Also, Martyr Place of Great Sikh Saint-Soldier Baba Banda Singh Bahadur. Mehrauli lies in the South district of Delhi at 28°30′57″N 77°10′39″E﻿ / ﻿28.51583°N 77.17750°E﻿ / 28.51583; 77.17750. To its north lies Malviya Nagar. Vasant Kunj lies to its West and Tughlakabad to its south. Like the rest of Delhi, Mehrauli has a semi-arid climate with high variation between summer and winter temperatures. While the summer temperatures may go up to 46 °C, the winters can seem freezing to people used to a warm climate with near 0 °C. The soil of Mehrauli consists of sandy loam to loam texture. The water level has gone down in the recent past hovering between 45 m to 50 m due to rise in population. Though Mehrauli is like any ordinary neighbourhood today, its past is what distinguishes it in terms of architecture. Ahinsa Sthal is a Jain temple located in Mehrauli, Delhi. The main deity of the temple is Mahavira, the 24th and last Tirthankara (human spiritual guide) of a present half cycle of time. A magnificent statue of Tirthankara Mahāvīra is installed here. Even though the capital shifted from Mehrauli after the Slave dynasty rule came to an end, many other dynasties contributed significantly to Mehrauli's architecture. The most visible piece of architecture remains the which was initiated by Qutub ud din Aybak with subsequent additions by Iltutmish and Alauddin Khalji. The Qutb complex is today a UNESCO world heritage site, and also the venue for the annual Qutub Festival. There are several pillars of temples adjacent to Qutb Minar , but they are in damaged condition. Mausoleum of a 13th century, Sufi saint, Khwaja Qutbuddin Bakhtiar Kaki is also situated near the Qutub Minar Complex and the venue for the annual Phoolwalon-ki-sair Festival. The dargah complex also houses graves of later Mughal emperors, Bahadur Shah I, Shah Alam II, and Akbar II, in an adjacent marble enclosure. To the left of the dargah, lies Moti Masjid, a small mosque, built for private prayer by the son of Aurangzeb, Bahadur Shah I.
Balban's tomb belonging to Balban, Slave dynasty ruler of Delhi Sultanate was constructed here in the 13th century can still be seen though in a dilapidated condition. The architecturally important structure as it is the first true arch in Indo-Islamic architecture, Another tomb, that of Balban's son, Khan Shahid, who died before he could be crowned, is also located nearby in Mehrauli Archeological Park. A baoli or stepwell known as Rajon Ki Baoli was constructed in 1506 during Sikandar Lodhi's reign. It was used to store water though it is now completely dried and is now known as Sukhi Baoli (dry well). The Jamali Kamali mosque was built in 1528, in honour of the Sufi saint Shaikh Hamid bin Fazlullah, also known as Dervish Shaikh Jamali Kamboh Dihlawi or Jalal Khan. The saint's tomb built in 1536 upon his death is adjacent to the mosque. The Adham Khan's Tomb was constructed by Emperor Akbar in memory of his foster brother and general Adham Khan in 1566. The tomb, also known as Bhulbhulaiyan, as one could get lost in the labyrinth of its passages, it was later used by the British as a residence, rest house and even as a police station. Close to Adham Khan's tomb, lies that of another Mughal General, Muhammad Quli Khan, later it served as the residence of Sir Thomas Metcalfe, Governor-General’s Agent at the Mughal court. The Mehrauli Archaeological Park spread over 200 acres, adjacent to Qutb Minar site was redeveloped in 1997. Mehrauli Assembly Constituency comprises four municipal wards, namely, ward 169 Lado Sarai (W), ward 170 Mehrauli (GEN), ward 171 Vasant Kunj (SCW) and ward 172 Kishangarh (W). All four wards are represented by women councillors in the Municipal Corporation. Concealed in a black polythene bag, a bomb was dropped by two unidentified persons riding a motorcycle In Sarai Electronic Market in New Delhi on September 27, 2008. Exactly a fortnight after three of the Capital’s top markets were targeted by terrorists, a medium-intensity blast ripped through the congested flower market in South Delhi’s Mehrauli area killing at least two and injuring 22 others. Indira Gandhi International Airport is approximately 17 km. Nearest Metro Station is Chhatarpur,Munirka, R K Puram, IIT Qutab Minar Metro Station. Adam Khan Tomb - Also known as Bhool Bhulaiya is situated next to Aggarwal Sweets and near Bus Stand. Gandhak ki Baoli - It is an ancient step well located near Mehrauli Post Office. Yogmaya Temple - Around 1 km from Qutub Minar and about 100 meters prior to Bus Stand. Village Roads - Village roads in Mehrauli are known in neighborhood as narrow poorly maintained roads. Non licensed street vendors/hwakers are very common sites on these roads. Tomb of Qutbuddin Bakhtiar Kaki, Mehrauli. Madhi Masjid entrance gateway, Mehrauli. Gandhak ki Baoli, stepwell, Mehrauli. Zafar Mahal built first by Akbar Shah II in the 18th century with addition by Bahadur Shah Zafar II. View of Jahaz Mahal from Hauz-i-Shamsi. ^ Rahul Khari (5 January 2007). Jats and Gujars: origin, history and culture. Reference Press. ISBN 978-81-8405-031-8. Retrieved 28 September 2011. In the contemporary Delhi, there are about 75 villages inhabited by the Gujars out of which 12 villages happened to be in Mehrauli where Gujars belonging to Tomar clan dwell, who call themselves 'Tanwar'. ^ a b "Seven Cities Of Delhi: Mehrauli". Government of Delhi Official website. Retrieved 16 September 2006. ^ "Rainwater level in Delhi". Retrieved 15 September 2006. ^ "Article on Delhigate.com". Archived from the original on 6 September 2006. Retrieved 16 September 2006. ^ "UNESCO website". Retrieved 16 September 2006. ^ a b c "Well worth a visit". Indian Express. 10 May 2009. ^ Jamali Kamali Indira Gandhi National Centre for the Arts. ^ a b Qutub Complex Archived 2008-06-03 at the Wayback Machine www.the-south-asian.com. ^ The tomb of Muhammad Quli Khan, brother of Adham Khan,.. British Library. ^ "Satbir Singh elected Mayor of Delhi". The Hindu. 12 April 2005. Retrieved 26 July 2018. 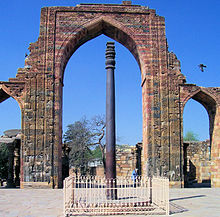 Wikimedia Commons has media related to Mehrauli. All About Delhi Delhi, the Capital of India, by Anon. Asian Educational Services, 1997. ISBN 81-206-1282-5. This page was last edited on 2 February 2019, at 14:35 (UTC).